What Are The Risks Of VASER Shape? How Much Does VASER Shape Cost? What Are VASER Shape Alternatives? Vaser Shape uses two ultrasound heads that are positioned next to each other and the ultrasound energy converges like a V below the surface of the skin. This means there is only half the amount of energy going through the skin as when the two beams combine in the subcutaneous tissue. After the fat has been disrupted, it dies and the body begins absorbs it and passes the fat out naturally. Patients can enjoy immediate reduction after just one session and may return for more treatment sessions. While some have lost as much as 2 inches in the first session, these results aren't to be expected for everyone. Patients can reasonably plan to see 3-4 inch total reduction over the course of 4-5 weeks with continued treatments. VASER Shape is not for those who have a lot of loose skin or are very overweight. It's much better suited for those who have a small area of fat to lose. Many areas can be treated such as the abdomen, arms, legs, back of legs and more. 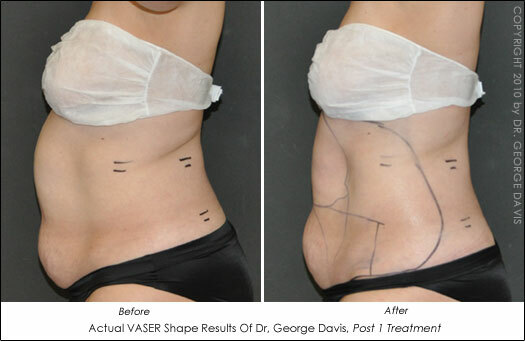 VASER Shape is not a replacement for liposuction or skin tightening procedures, but it is a viable option for patients who want to avoid surgery. There are very few risks associated with the procedure as it is a non-surgical procedure. Patients can return to work and normal activity right away. Prices vary by geographic region, but most offices charge a per treatment cost of around $600-$900 depending on the area treated. VASERshape is known as Med Contour in Europe and FDA approved under the name MC1 in the United States. Watch for this on Dr. Oz's Newest, Fastest Fat Busters!